A region of vast expanses and unparalleled natural beauty, the southwestern United States is a land of harsh socioeconomic realities for many, especially for underserved Native American and Hispanic populations. The Southwest has some of the highest poverty rates in the country, some of the lowest rates of health care access and a widespread incidence of serious chronic diseases, infectious diseases and behavioral health problems. Health disparities—defined by Healthy People 2020 as “a particular type of health difference that is closely linked with social, economic and/or environmental disadvantage”—are one of the most compelling social issues facing the region today, say researchers. Building on its long history of serving underrepresented populations in Arizona and beyond, Northern Arizona University has established a new research center underscoring its ongoing commitment to addressing these health disparities. Funded for the next five years through a $21.4 million grant from the National Institute on Minority Health and Health Disparities, NAU’s Southwest Health Equity Research Collaborative (SHERC) will focus on increasing the university’s basic biomedical, clinical and behavioral research capacity to address health disparities among diverse populations of the region. Among the largest grants received at NAU, the SHERC grant will give NAU the ability to make significant strides in these areas. 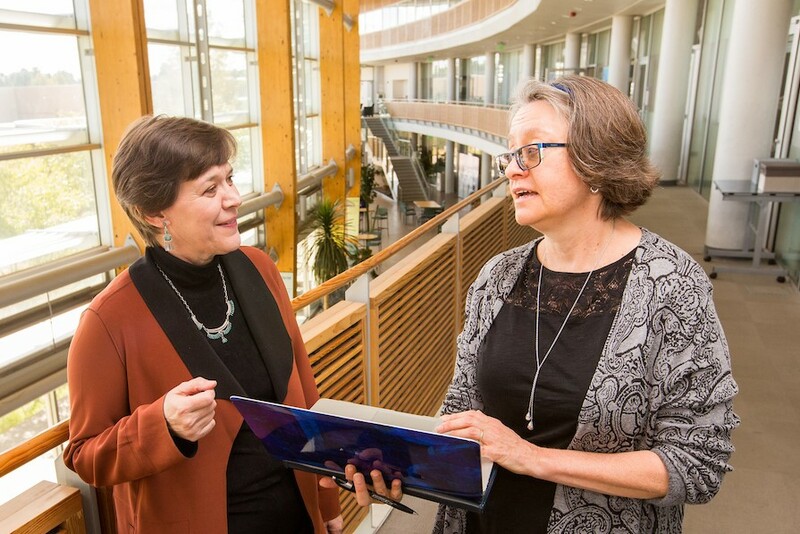 Professor Julie Baldwin, director of the Center for Health Equity Research (CHER), and professor Diane Stearns, associate vice president for research, will co-lead the collaborative center. SHERC, which will be housed within CHER, will offer researchers development opportunities that will help grow NAU’s research capability in the health sciences. NAU has always been dedicated to serving the community, so the new center is exciting, Stearns said. Stearns credited President Cheng’s efforts to recruit research-intensive faculty with NAU’s successful bid for the multimillion-dollar grant. Since arriving at NAU in 2014, the president has supported an initiative to identify and recruit high-impact, nationally known scholars in ecosystem and climate science, environmental health, health equity, cybersecurity and advanced materials. “Bringing Julie Baldwin to NAU—as well as her colleagues, professor Nicolette Teufel-Shone and associate professor Samantha Sabo—made us competitive for this grant. It demonstrates how well Dr. Cheng’s direction is paying off,” Stearns said. Baldwin and Stearns will direct the Administrative Core. Regents’ Professor Robert Trotter II and professor Paul Flikkema will direct the Research Infrastructure Core. Stearns and professor Anna Schwartz will direct the Investigator Development Core. Teufel-Shone and Sabo will direct the Community Engagement Core. Baldwin will direct the Recruitment Core. Research assistant professor Talima Pearson will study the impact of social relationships on transmission of Staphylococcus aureus and other bacteria among different ethnic groups in Yuma. Associate professor of practice Robert Kellar and professor Catherine Propper will investigate the influence of arsenic-contaminated water on wound healing outcomes. Assistant professor Archana Varadaraj will determine the ways that cancer cells use secreted fibers to attract blood vessels for tissue invasion in order to develop therapeutic strategies to fight cancer. Assistant professor Narendiran Rajasekaran will develop reovirus-activated immune cells as possible therapies against colorectal and breast cancers. Assistant professor Viacheslav “Slava” Fofanov will characterize the oral microbiomes that may make young children more susceptible to early tooth decay. Congratulations to all involved! Very exciting!